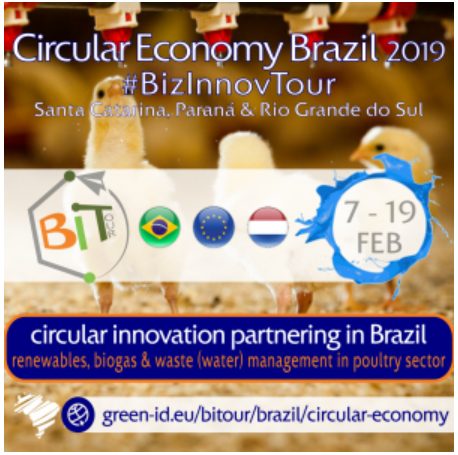 Home > News > Circular Economy BiTour Brazil invites projects on renewables and waste management for the poultry industry during 2019. This trade mission is dedicated to co-creation of business cases and technology matchmaking to act on opportunities being identified by Green-ID on circular economy in Rio Grande do Sul, Santa Catarina and Paraná states. Brazil is the #2 poultry exporter in the world. These states represent about 60% of the Brazilian poultry industry. The call is open until 30 JAN 2019 for technology companies based in the Netherlands and European Union member states. Feasibilty study outcomes will be made available to participants. Green ID conducts a feasibility study in collaboration with CIBiogas during 2018/2019 with support of Phase 2 of Low Carbon Business Action Brazil program; initiative funded by European Commission. Interested in a demonstration project with a local partner? You should have a demonstrated technology and already clients in Europe or world-wide. Further eligibility requirements are checked during application process to perform a preliminary check on funding alternatives during next steps towards implementation. Trade mission voucher (subsidy) available for Dutch companies. Apply until January 30. More information.